The steps of charging a powder into a cavity of a container and, after the charging step, vibrating a swinging body on the powder which is held in the cavity, thereby filling the powder with a high density. Since the swinging body swings in the cavity, it is possible to fill the powder in the container with a high apparent density being improved much more than conventional processes for filling powders. The process is applicable to an apparatus for filling a powder and a process for producing a composite material. Powder Filling machines are used to fill containers with liquids, granules, powders, and sprays for consumer, bulk and original equipment manufacturer (OEM) of pharmaceutical products. The choice of system is dependent upon the speed required, batch size/changeover times and budget available. The upper speed limit for semi automatic filling is dictated by the time taken to manually handle the container. If two seconds is allowed for picking up the container, presenting it to the filling nozzle and putting it down again, a one second fill time will restrict the output to 20 fills per minute. Others factors will limit the output are Larger fill weight, Slow auger rpm required due to a tendency to damage the product or generate dust, small container neck opening restricting the auger diameter, Container handling difficulties, bags/sacks etc. Powder Filling Machines are suitable for sterile, injectable, dry syrup powder filling. The basic machine is fitted with parts suitable for any one fill size of powder. Powder fillers fill powder into vials or bottles. Dosage plate in the machine ensures uniform powder flow and precise powder filling. Powder shield plate eliminates powder spilling and increase the density and uniformity of the filled capsule. Multiple dosing of dry syrup powder or change over of container size and different fill size is possible by just changing the bottle separator or the size of the position respectively. Accuracy and high precision is a requisite for powder filling machines to ensure that proper dosage goes into the package. Certain machines allow flexibility to accommodate different package sizes and product consistency. 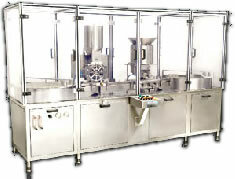 Powder filling machines are used in Pharmaceutical, Cosmetics, Chemical, and Food & beverage industries. The high quality automatic powder filling machines are suitable for all powders and granules. The design features includes High Filling accuracy, Microprocessor controls, zero ripping, accurate slippage control, Fills Free Flowing, 100% in process control, eliminates costly hand weighing etc. Equipment that can be used in conjunction with filling machines includes accumulators, batching machines, bagging machines, sleevers, capping, combining, counting, forming and sealing. The types of powder filling machines are dry syrup powder filling machine, automatic powder filling machine etc. In the process of powder layering an active substance is layered as a powder onto cores. There are various methods for powder layering such as Fluid Bed Rotor, Coating Pan, and Solid Drug Layering technology. Sustained or controlled release formulations often use powder coating technologies for the production of pharmaceutical products. These processes are characterized by the deposition of a uniform film onto the surface of a substrate. The active ingredient can be dosed in powder form simultaneously spraying a solvent, sprayed as a suspension or a solution. There are different types of layering equipment required to handle the various cores and coatings. In Fluid Bed Rotor system, powder is mixed and moistened in the fluid bed rotor. With the fluid bed rotor, solvents or binders are added tangentially and centrifugally moved by the rotor in a spiral motion. Very thick film layers can be applied by means of the rotor method allows very thin to very thick layers to be incorporated with an increase in weight of up to 10 times the original weight. With Solid Drug layering technology automated solvent and powder addition to drug layer over pellets. It offers the distinct advantages of higher rates of drug or film layering than is possible either fluid bed rotor or pan. It is also less expensive. Coating Pans offer the final of three technologies for layering. Coating pan system gains the advantages of the perforated pan for faster solvent removal with the advantages of the solid pan for handling smaller pellets.